The Helm Portal™ Downtime Tracking and Production Monitoring System provides an affordable, easy to use data collection system for your production machines. 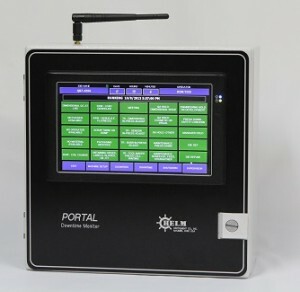 Helm Portal systems monitor and collect data for idle time, production time and downtime. The software automatically records data based on shift, job, material type, part number and operator. 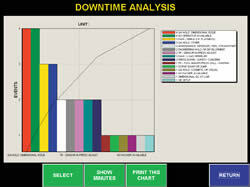 The downtime data can be displayed graphically using charting functions such as pie and pareto charts. 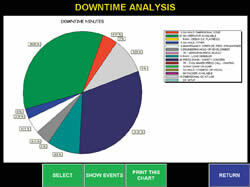 Reports can be generated by machine, job number, downtime reason, operator and shift. The Helm Portal features a RISC Processor based system running Microsoft™ Windows CE. Ethernet connectivity is provided for data logging to any location on the LAN (Local Area Network) or Internet. The Portal is configured with ease, supporting established network connections using standard Ethernet/IP addressing. This gives the Portal the ability to work as a message center, notifying operators of production requirements and broadcasting bulletins.